Lava Lamp is an electric lamp which contains the brightly colored substance. This bright substance rise and falls while changing their shape. Lava lamps give a good background decoration and grasp the attention of people. So, here you will learn how to a make lava lamp. This lava lamp won’t require electricity to operate. All the materials you will find easily in your kitchen. Fill the bottle about a quarter with water. Fill the remaining space of the bottle with vegetable oil, and keep it aside for 5 minutes. When oil and water become separated from each other, then proceed to next step. Add few drops of food coloring of your choice in the bottle. It will take some time to break-through the oil and the water. Break the seltzer tablet into four pieces and drop one piece in the bottle. Watch it sinking to the bottom. When seltzer tablet will touch the water your lava lamp will start to work. When bubbles stop to form add another piece of seltzer tablet to water. When oil and water are mixed, they form two layer. The oil settles at the top, and water at the bottom. Because, oil is less dense than water, so it floats on water. When you drop the seltzer tablet to bottle it goes to water layer and starts to form bubbles by a chemical reaction. These bubbles go up taking some colored water with them. At the top of the bottle, air escapes and leaves the water behind, which falls back down. Doing so it creates a nice effect of a lava lamp that you enjoy. 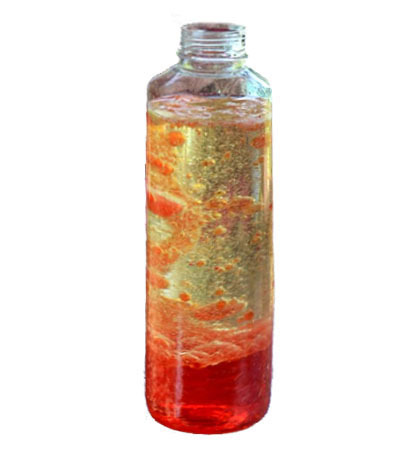 Abdul Wahab, "How to Make Lava Lamp at Home," in Science4Fun, April 13, 2019, http://science4fun.info/how-to-make-lava-lamp-at-home/.